In 1980, Dr. Gerald O. Barney directed the Global 2000 Report for President Carter. This was the first and only report by any national government on the economic, demographic, resource, and environmental future of the world. It sold over 1.5 million copies in 8 languages! Now, in this new, updated Global 2000 Revisited: What Shall We Do?, Dr. Barney, Jane Blewett, and Kristen Barney have assembled new data on global trends - and challenged the world to devote the 1990s and beyond to addressing the critical issues of the 21st century. If present beliefs and policies continue, the world in the 21st century will be more crowded, more polluted, less stable economically and ecologically, and more vulnerable to violent disruption than the world we live in now . . . Overall, Earth’s people will be poorer in many ways than they are today. Global 2000 Revisited is both thunder and lightning across the landscape! Thunder of terror if we continue as of the present! Lightning revealing the grandeur of a possible future! What Shall We Do? explains gently but powerfully the seriousness of the human situation. I’ve read parts of it to my family members. It has changed their thinking and mine - and helped put environment on the agenda of Muslim women. 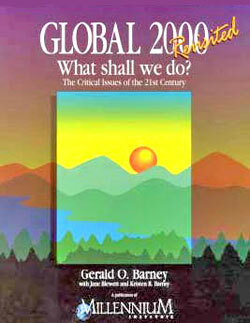 Like the original Global 2000 Report, this book shows the dire straits to which humans have brought the world. But I have no faith that the world’s spiritual leaders will help. They are themselves a major part of the problem! This report has been at least twenty-five years in the making. It would not have been possible without the love, support, and encouragement provided by my wife Carol, by our children, Bill, Kris, and Steve, and my father, Richard, and my mother, Gladys, now deceased. Also essential has been the intellectual and moral support of my extended family, the members of the Holy Trinity Forum. For fifteen years now, these twenty-five friends have met monthly for an evening of discussion of how their faith influences how they live. My co-authors, Jane Blewett and Kristen R. Barney, have written key passages and made essential suggestions and criticisms throughout the writing process. Their ideas have given shape, structure, and content to the whole document. The intellectual contributions of several people have been particularly important. Among them are: Fr. Thomas Berry, Professor Jay W. Forrester, Dr. Sallie McFague, Rabbi Herman Schaalman, Dr. S. Z. Abedin, the Reverend Daniel Wee, Bishop Harold Jansen, Dr. Larry Rasmussen, Dr. Alan M. Rulis, Dr. Martha J. Garrett, Mr. Leo Harris, and the Reverend Frank Lee. E. Leger, Dr. Colette Mahoney, Mr. Alan Pilkington, Dr. D. Jane Pratt, Dr. Carlos A. Quesada-Mateo, and Ms. Michaela L. Walsh. Many others have contributed. The first are those who heard lectures on this material since 1980 and commented on the substance and presentation. A very early draft of the book was presented at a conference sponsored by the Council for a Parliament of the World’s Religions at De Paul University, Chicago, on October 13, 1990. The following persons presented helpful comments at that time: Dr. Diane Sherwood, Dr. Aminah B. McCloud, Mr. James Buchanan, Dr. Dennis McCann, and Reverend George F. Cairns. A few months later, the Council for a Parliament of the World’s Religions established a committee on critical issues consisting of Professor Ronald Engel, Dr. Daniel Gomez-Ibanez, Mr. Jim Kenney, Dr. Lois Livezey, Fr. John Pawlikowski, Dr. David Ramage, and Rabbi Herman Schaalman. This committee reviewed the early drafts. Rabbi Schaalman, Dr. Engel, and Professor Livezey made especially helpful suggestions concerning the questions for spiritual leaders that appear near the end of the report. An oral version of the report was presented November 18, 1992 at the Harvard Seminar on Environmental Values, organized by Dr. Timothy C. Weiskel. Fifteen faculty members and guests from The Divinity School and other parts of Harvard University heard the presentation and many made suggestions for improvements. The following persons reviewed drafts of the manuscript: Dr. David Peterson, Ms. Laura Peterson, Professor Gordon D. Kaufman, Dr. Daniel A. Gomez-Ibanez, Mr. Patrick O’Brien, Dr. Glenn Kuswa, Ms. Martha Campbell, Professor Steven C. Rockefeller, Dr. Vivienne Simon, Dr. Robert Goodland, Dr. Herman Daly, Reverend William E. Gibson, Mr. Allan F. Matthews, Mr. Jim Kenney, Dr. Gordon Brown, Ms. Barbara Bernstein, Ms. Diane Brenneman, and Mr. Kip Cooper. R. Barney contributed greatly to the design of the figures and prepared most of them; she also designed the format for the report. Mr. Gary T. Gardner also contributed to the work on the figures and to the editing. Ms. Leigh Ann Evanson and Ms. Kirsti A. Lattu typed many of the drafts and helped format the final document. Thanks also to Shirley N. Nunh for proof reading and to Lou Niznik and Craig Gotschall for graphics and photography assistance. We are especially grateful to an anonymous donor, Mr. Dan Aykroyd, Dr. Cynthia Harris, Mr. Leo Harris, Mr. John A. Harris IV, Los Trigos Fund, the Mitchell Energy & Development Corporation, the Rockefeller Brothers Fund, the Trinity Grants Program, and the Wallace Genetic Foundation, who have supported the work on this report. The book you are holding is an invitation to reflect deeply on the critical issues we face today: threats to the global environment; divisions within the human community, such as racism, interreligious hatred, sexual discrimination, and xenophobic nationalism; extremes of affluence and poverty; and the prevalence of violence, oppression, and exploitation of all kinds. The book is also an attempt to make clear the relationships which each of these issues has with all the others. Such a portrait is difficult to paint and may be hard to see, because most of the time we perceive and think serially, one idea after another. But the real world in all its variety and interdependence is a complete and simultaneous whole. What we do in one area affects all other areas. It is difficult to deal with one problem without inadvertently causing other problems. Most of us will be able to think of everyday examples of this, and many global examples are described in this book. When we are not aware of this interdependence we easily make mistakes. But when we know how things work together we may discover that one wise action brings benefits in many places. It should also be apparent that the interrelationships extend not only throughout the physical realm, but also to the worlds of ideas, cultures, traditions, values, and beliefs. Values we often take for granted have important consequences for the way we treat each other and the way we treat the earth. A great danger in a materialistic and mechanistic view of the world’s problems is that even when we see the problems, we often assume that the solutions are to be found only in the same material realm. Thus, for example, most proposals for cleaning up the environment focus on technical fixes. But the greatest help and the only lasting solutions to the violence we do to the world and to each other will come from wisdom -- from rediscovering ways of seeing ourselves clearly. This includes seeing our close connections with one another while at the same time enjoying and cherishing our incredible diversity. This book is rooted in the idea that our perceptions, values, and attitudes hold the key to what we must do to make this world a better place. It encourages us to look at the planet and our place in it as a whole system -- even to "see with the heart" how we are interrelated with every aspect of creation. It asks the reader to reflect on the consequences of beliefs, however ordinary or ingrained. And it challenges us to begin the process of answering the question, " What shall we do?" by examining ourselves and the communities we live in. These are communities of shared culture and values, and for many persons these communities include the spiritual and religious communities of faith. Even for those who may not consider themselves "religious," religion matters because it is the basis for much of our ethical culture. Fundamental to a culture are the shared explanations of creation, the rules for living, the teachings of seers and gods, and the stories of how and why the world ends. No consideration of the critical issues is complete if it ignores questions of belief. There have been many conferences, projects, and events highlighting the enormous difficulties facing us and our children all over the world. There is an urgent sense that we must take individual and collective action. Most of the response has been political, like the creation of the World Commission on Environment and Development, or the U.N. Conference on Environment and Development. But the 1993 Parliament of the World’s Religions will be different. It will demonstrate the religions’ commitment to issues which usually are considered secular, and it will demonstrate their adherents’ and their leaders’ willingness to work together for peace and the health of the planet. The purpose of the Parliament is to find practical ways we can live peacefully and sustainably, communicating and understanding, respecting one another’s diversity, and protecting the common ground which nourishes all life. The time is right for this gathering. It coincides with a growing awareness of the limitations of our technological and political ingenuity. It responds to a growing confidence in the power of spiritual understanding and the desire for wisdom. Global 2000 Revisited: What Shall We Do? is our way of inviting you to this work of reconciliation and peace. As you prepare for the 1993 Parliament of the World’s Religions, please reflect on the questions raised by this book. What can you put into practice? Then come to the Parliament to share your wisdom and the wisdom of your faith, and to listen to the wisdom of others. My colleagues and I at the MILLENNIUM INSTITUTE are delighted to join with the Council for a Parliament of the World’s Religions in preparing for the 1993 Parliament of the World’s Religions. Our part has been to prepare this report on the critical issues of the 21st century. As you will see, many of the trends before us are troubling. We look forward to working with you and others to ensure that our future is very different from the one toward which we seem now to be rushing. In preparing this report, we have, in a sense, revisited The Global 2000 Report to the President, the report I directed for the United States Government. Global 2000 is the first and only report by any national government on the economic, demographic, resource, and environmental future of all countries of the world. Published in 1980, it has sold 1.5 million copies in eight languages. Global 2000 is now 13 years old, and although most of its trends are still disconcertingly accurate, it needs updating. This report assembles new data on most of the basic trends reported in the original Global 2000. This is why I gave it the title Global 2000 Revisited. It is not, however, a full update of Global 2000. Only the U.S. Government can do that job, and we hope that President Clinton will. A major part of the MILLENNIUM INSTITUTE’S work is encouraging and assisting countries in the preparation of long-term strategic studies of their options for sustainable development and security. We call such studies "21st Century Studies." In one way or another over the last decade, we have helped research teams in a fifth of the countries of the world as they prepared a long-term outlook for their country. We feel that it is important to include spiritual leaders in the process of preparing national 21st Century Studies, but only rarely does this happen. There are several reasons. Often national leaders doubt that spiritual leaders have a sufficient understanding of the contemporary analytical methods used by economists, ecologists, demographers, and geographers to participate effectively in a national strategic study. Sometimes two or more of the country’s spiritual traditions are in violent conflict, and the political leaders doubt that spiritual leaders could converse constructively among themselves and with others about future possibilities. In other cases, there are extreme tensions between the nation’s political and spiritual leadership. The Board and staff of the MILLENNIUM INSTITUTE believe that spiritual leaders have a vital contribution to make to a country’s reflections on sustainable possibilities for the future. During the Parliament of the World’s Religions, we hope to meet many of you and to discuss the possibility that you might like to participate together with political leaders in the exploration of alternative futures for your countries. We at the MILLENNIUM INSTITUTE also believe that the entry into the 21st century and the new millennium needs to be understood as an anniversary of Earth, an anniversary in which all nations, cultures and faith traditions participate. The 1999-2001 period must be a time when five billion of us humans give up old, 20th century ways of thinking and living; change to a new time and a new purpose; and then start toward the humane and sustainable future that we can all share. The MILLENNIUM INSTITUTE is nurturing a worldwide network of individuals and organizations that are planning to use the 1999-2001 period to encourage a major shift in human attitudes and institutional goals, a shift toward a sustainable future. We hope the spiritual leaders at the Parliament will join the planet-wide effort. Beyond these institutional reasons for our participation in the Parliament, my colleagues and I feel an urgent need for a more substantive dialogue between "secular" issue experts and spiritual leaders of all faith traditions. There are many pressing issues that need thoughtful, holistic attention, integrating both the spiritual perspective and the secular or scientific perspective. Such integrated work is difficult because of limited trust and respect on both sides. In the course of my work for the MILLENNIUM INSTITUTE, I have had many conversations with political leaders and with ecologists, economists, geographers, modelers, political scientists, and other leaders about the role of the spiritual traditions in the future of Earth. I have been disturbed by the attitudes that some professionals have expressed toward the spiritual traditions. For example, an internationally famous, highly influential author on sustainable development told me bluntly, "Religion must die. It is the fundamental cause of virtually all social, economic, and ecological problems and much of the violence in the world." In another example, an ecologist, who has devoted his life to the practical work of preserving specific endangered species, was equally vehement in his feelings that religion generally, and mine (Christianity) in particular, was a menace to the future of Earth. After I explained the importance of my faith to me in the work I do, he was silent for a moment, and then said with total sincerity, "You have done some very important work, but just think of how much more you could have done if your parents had not exposed you to the pernicious influence of Christianity!" This is a serious public charge against my faith. It troubles me that the charge was made. It troubles me that it might be true. It troubles me that my faith has made no thoughtful or significant response to the issue raised by Time. Christianity is not alone in coming under criticism. In one forum or another, virtually every faith tradition is being criticized today for not having a thoughtful, informed, penetrating analysis of the issues facing Earth and Earth’s human community in the 21st century. We, the people of Earth, need the help and involvement of our spiritual leaders. It is from our respective faiths that we derive our sense of origins, of self, of purpose, of possibility. You are our source of inspiration for what we humans and Earth can become. Your dreams are our visions -- and our destiny. We depend on you. So we come to you both with our perplexed sense that something is terribly wrong on Earth and with our question: What shall we do? If present beliefs and policies continue, the world in the 21st century will be more crowded, more polluted, less stable economically and ecologically, and more vulnerable to violent disruption than the world we live in now. Serious stresses involving interreligious relations, the economy, population, resources, environment, and security loom ahead. Overall, Earth’s people will be poorer in many ways than they are today. For more than a billion of Earth’s desperately poor humans, the outlook for food and other necessities of life will be no better. For many it will be worse. Life for billions will be more precarious in the 21st century than it is now -- unless the faith traditions of the world lead the nations and peoples of Earth to act decisively to alter current beliefs and policies. This, in essence, is the picture which emerges in Global 2000 Revisited: What Shall We Do? This picture is based on projections of probable changes in the world economy, population, resources, and environment. Although these projections are drawn from the most reliable sources available, they do not predict what will occur. Rather, they depict conditions that are likely to develop if there are no changes in beliefs, public policy, and practices. A keener awareness of the prospects for the 21st century, however, may induce significant changes in beliefs, policies, and practices. Rapid growth in the world’s population cannot continue through the 21st century and will come to an end either by human decision and action or by an uncontrollable increase in deaths. Over the past 70 years -- roughly one lifetime in many countries -- the human population grew from 1.8 billion to 5.3 billion. For every person alive 70 years ago, there are now three. Such rapid growth cannot continue for even another generation. Fertility must decline, or mortality will increase. But for now the growth continues. Currently the world’s population is growing faster than ever before. Each year, 90 million people are added to our numbers, the demographic equivalent of another Mexico. Just a lifetime ago, we were adding only 15 million people per year. If drastic declines in human fertility (or very large increases in mortality) occur over the next five years, it would be possible to stabilize the human population at about 12 billion within a century. Virtually all of the additional growth -- more than 6 billion -- would occur in the poorest, least industrialized countries of the world, often called the "South." The population in the South would grow to over 10 billion. The population in the industrialized countries of the "North" would remain at about its current size, a little over 1 billion. For such a rapid drop in human fertility to occur, it will be necessary to change the religious, social, economic, and legal factors that shape couples’ decisions on the number of children they have. Safe and effective contraceptive services must be available, but most importantly, religious teachings and social, economic, and legal circumstances must shift to encourage small families. Child labor, for example, must cease to provide an economic benefit to parents. It will be difficult to provide 11 to 12 billion people with even such basic necessities as food. Of the 14 billion hectares of land on Earth, only 3.3 billion hectares are potentially arable. At current yields, 0.26 hectares per person are needed to feed the human population; thus at current yields, 3.1 billion hectares would be needed to feed 11 to 12 billion. Only 1.5 billion hectares are currently in production. Since in most cases the best lands are already in use for agriculture, and the remaining lands are already used for grazing or some other use, a doubling of the land in agricultural production would be expensive and disruptive. Doubling the world’s agricultural lands would also cause enormous environmental damage. The potentially arable land that is not now in use -- especially land in the tropics -- is habitat for a large number of species. Doubling the amount of land in agricultural production would lead to massive extinctions. Even with modest growth in the amount of land in production, a third of all the species that were alive a lifetime ago will become extinct -- gone forever -- within another decade or two. By 2015, hundreds of species are projected to disappear daily. If we are to meet the food needs of up to 12 billion people by the end of the 21st century, it is essential that agricultural yields continue to be increased -- and in ways that are sustainable. Although conventional technologies can probably double yields, there are increasing questions about the sustainability of conventional agricultural technologies. Furthermore, the promised benefits of yield increases through genetic engineering may be delayed and more modest than expected. The so-called Green Revolution began about 1950. For the first time, yield-increasing technologies (plant breeding genetics, fertilizers, pesticides, and pumped irrigation) were applied extensively and systematically during the last half of this century, increasing yields dramatically and preventing serious food shortages. But the Green Revolution also changed agriculture radically, making it dependent both on environmentally destructive practices (especially the use of pesticides, fertilizers, and irrigation) and on fossil fuels. Energy used for corn production in the United States, for example, has increased by a factor of four since 1945. The future of human food supplies is now closely linked to the future of energy supplies. Global energy supplies and prices are likely to become more unstable and erratic in the decades ahead. Even at present rates of consumption, most of the world’s petroleum would be burned within the lifetime of a child born today. If consumption were to increase enough to fuel economic growth in the South, the petroleum supplies of the world would disappear even more quickly. The most pressing constraint on the use of petroleum, however, may not be supply of the resource, but disposal space for its principal combustion product -- carbon dioxide. The concentration of carbon dioxide in Earth’s atmosphere is increasing around the world, largely because of the combustion of fossil fuels in the industrialized North. Within the lifetime of today’s children, global concentrations of carbon dioxide are likely to reach twice pre-industrial concentrations. Such high concentrations are expected to cause planet-wide changes in temperature and weather patterns. Such changes would seriously disrupt agriculture throughout the world as early as the first half of the 21st century, and during the second half would lead to a sea level rise of 20 to 30 centimeters - enough to force the resettlement of hundreds of millions of people and the abandonment of some island nations. The critical issues described above are just a few of the challenges that lie ahead. Others that have not even been touched on include the implications of AIDS and tuberculosis; nuclear, chemical, and biological weapons; the global debt; migration; corruption; drug trade; and technological change, to name a few. Given the magnitude of the issues we face, we must expect that within the lifetime of a child born today, the world will change radically in one of two directions. If we continue with present beliefs, institutions, and policies, the world will become highly polarized, with a billion people in the wealthy industrialized countries of the North attempting to enjoy life and leisure a few decades longer while 10 billion plus people in the South spiral downward into increasingly desperate poverty exacerbated by global environmental deterioration. Ultimately the North spirals downward too, and the whole planet drifts off into a new dark age or worse. (i) bring equity between nations and peoples of the North and South. We do not have generations or even decades to choose between these two directions because of the momentum inherent in population growth, capital investments, technological choices, and environmental changes. In fact, the choice of direction for Earth is being made today. (f) we lack a set of common moral values on which to base collective action. Most difficult, however, is to accept that our concept of progress has failed. Our concept of progress -- our model of development -- measures every nation by the norm of a so-called "developed" country. Under this concept of progress, each "rational" nation is to progress to the economic and military might of the "developed" countries of the industrialized North. Similarly, the goal of each "rational" person is to progress to the point of being able to live like the wealthiest. This concept of progress has failed. Twelve billion people cannot live like the wealthiest do now. All nations of the world cannot become as wasteful and environmentally destructive as the industrialized North is now. For them to do so would increase the total economic activity of the world by a factor of five to ten, and Earth could not withstand such an assault. What is our alternative? What other concept of progress -- what other model of development -- can we pursue? Currently there is no agreed upon answer to these questions. But if we people of Earth are to avoid a massive disaster within the lifetime of our children, our most critical and urgent task is to bring forth a transformed vision of progress, one of sustainable and replicable development. We are discovering (or rediscovering) that our human economy is part of, and depends on, the "economy" of the whole ecosphere. So any model for a sustainable world must address both our habits of consumption and reproduction and our willingness to live peacefully with one another, with other creatures, and with Earth itself. Our definitions of progress and success must take into account the future well-being of the entire ecosphere, not just the human part of it. Such a changed understanding of progress and success will require a new understanding of humankind as a species, a new approach to the ethics of interspecies relations, and a new vision for the future of Earth. What are the traditional teachings -- and the range of other opinions -- within your faith on how to meet the legitimate needs of the growing human community without destroying the ability of Earth to support the community of all life? What does your faith tradition teach about how the needs of the poor are to be met as human numbers continue to grow? What does your faith teach about the causes of poverty? What trends and prospects do you see for the poor? How are the needs and wants of humans to be weighed relative to the survival of other forms of life? What trends and prospects do you see for other forms of life? What are the traditional teachings -- and the range of other opinions -- within your faith on the meaning of "progress" and how it is to be achieved? What does your faith tradition teach about the human destiny? Is the human destiny separable from that of Earth? What is your destiny, the destiny of the followers of your faith tradition? What does your tradition teach concerning the destiny of followers of other traditions? How are we to measure "progress?" Can there be progress for the human community without progress for the whole community of life? How is personal "success" related to "progress" for the whole? What are the traditional teachings -- and the range of other opinions -- within your faith tradition concerning a proper relationship with those who differ in race or gender (conditions one cannot change), or culture, politics, or faith? Much hatred and violence is carried out in the name of religion. What teachings of your faith tradition have been used -- correctly or not -- in an attempt to justify such practices? Discrimination and even violence by men toward women is often justified in the name of religion. Which, if any, of the teachings of your faith have been used -- correctly or incorrectly -- in this way? How does your faith tradition characterize the teachings and followers of other faiths? Do some adherents of your tradition hold that the teachings and followers of other faiths are evil, dangerous, misguided? Is there any possibility that your faith tradition can derive wisdom, truth, or insight from the teachings of another faith? What are the traditional teachings -- and the range of other opinions -- within your faith on the possibility of criticism, correction, reinterpretation, and even rejection of ancient traditional assumptions and "truth" in light of new understandings or revelations? Does your faith tradition envision new revelation, new understanding, new interpretation, new wisdom, and new truth concerning human activity affecting the future of Earth?